Normally when I take Oliver to the park, he spends the majority of the trip cruising in the stroller or hanging out on my back in the Ergo carrier. 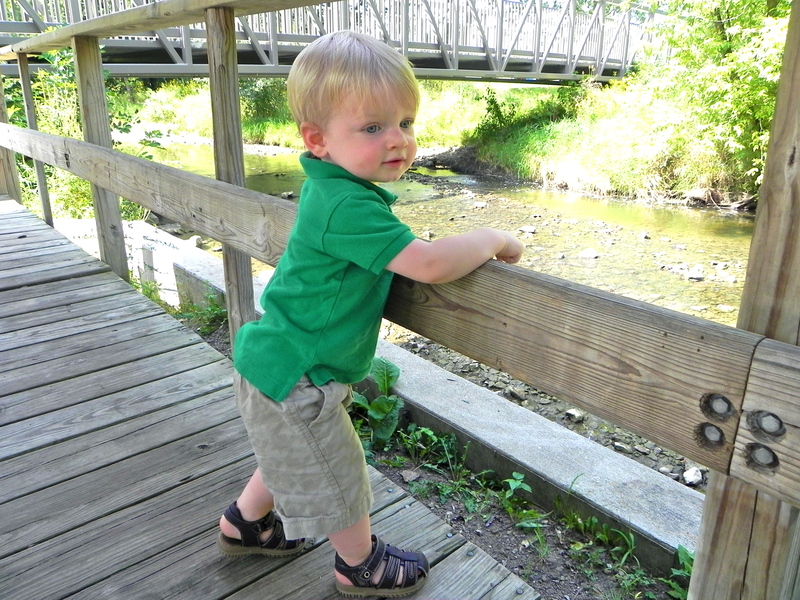 He gets to sit back and relax and enjoy the scenery while I get to spend some time unplugged from vigilant mommy mode. It’s a win-win. 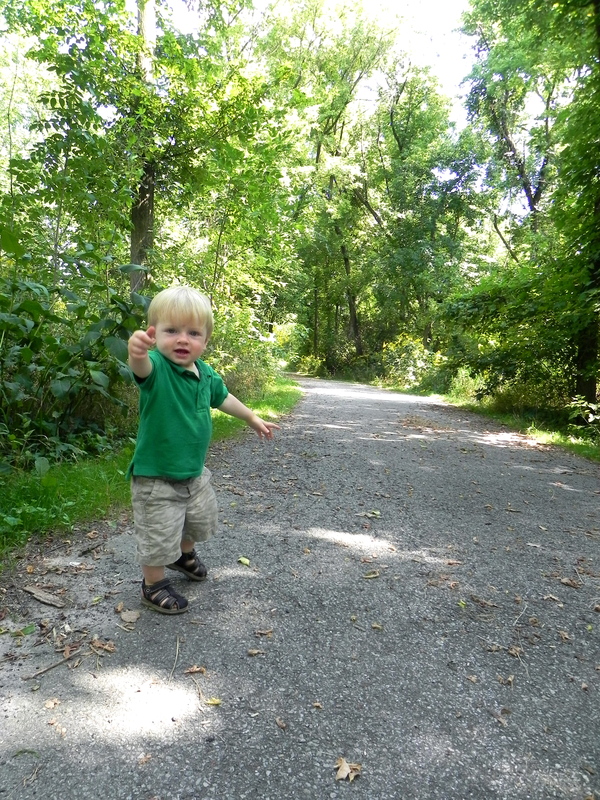 On our most recent park trip I decided to leave behind the comforts of the stroller and (gasp) let Oliver walk. You know, that thing he’s been doing with his feet for over two months now. A few logistical problems quickly made themselves present. 1) Where do I stick those extra diapers, wipes, sippy cups, cheerios, and other baby paraphernalia I normally cram in the stroller? How will we ever survive without our gear? Can I bring cargo pants back into fashion for the occasion? 2) What do I do if Oliver gets tired and refuses to walk another step? Am I really expected to carry him?…with my arms? I haven’t been trained in long-distance baby transport. That’s a 20 week training plan minimum, and I’m at least a couple weeks from starting it. 4) Since walking often doubles as exercise time, can I still count my 0.1 mph stroll as a work out? If I end up walking in circles for 30 minutes can I call it circuit training? If not, does this mean I have to actually go to the gym? Despite the insurmountable odds (cough…no facebook…cough) we were off and running. Make that off and toddling. Oliver didn’t waste anytime unleashing my concerns. Oliver completely ignored the rock in my extended hand and went for another one on the ground. He held it between his fingers, inspecting it the way a jeweler might look at a fine diamond. “Good job! In your hand.” I say too enthusiastically. A frantic hope creeping into my voice because maybe, just maybe he gets it. And the new rock goes into his mouth. 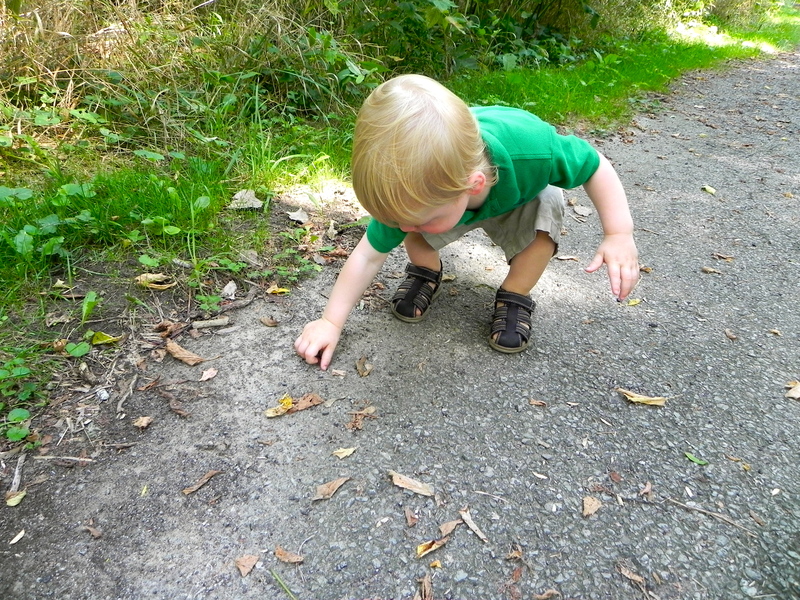 I remove it and usher him down the trail, trying to focus his attention on something larger. Something that isn’t a choking hazard. Oliver takes a couple steps and plops down on the ground. The lure of the rocks is too great. Well, at least we are only 10 feet from the car, I think. I can handle a 10 second carry. If only I had the cheerios or puffs to bribe him with. I learned long ago that bribery is the foundation of any good parent/child relationship. Just when I’m about to pick him up he is on the move, sprinting down the trail at a 0.2 mph pace. Maybe this will be a work out after all! 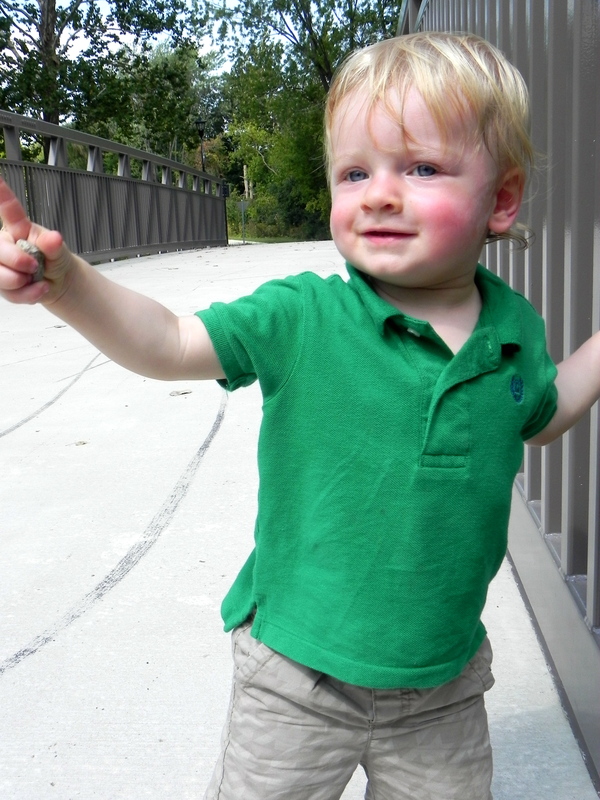 I saunter after him watching as he gleefully points at every flower he passes. “Yes, flower. Isn’t it pretty Oliver?” I ask him. I watch him looking at the flower, a sense of wonder spreading across his face. My gaze shifts between him and the flower. It really is a pretty flower. I had never noticed it before. I get caught up looking at the flower only to realize Oliver is a good 10 feet down the trail and getting dangerously close to taking a bath in a small stream. I chase after him and pull him onto a overlooking deck. He shrieks as the water gurgles past. I sit down next to him and listen to the quiet babble. There is a feeling of tranquility and calm sitting by that water that I never experience during my stroller sprint. In fact, I had rarely taken notice of the water until then. Oliver’s attention is short-lived and we are once again heading down the trail. I let him walk ahead of me. I watch him taking in the world around him: the sun glinting through the tree tops, the sound of the birds skittering among the branches, and the smell of summer coming to an end. For a moment, I forget about the stroller. I forget about the cheerios, the sippy cups, and the diapers. I forget about my exercise agenda. I forget about facebook, about digitally connecting with people that aren’t with me right now, in this moment. That’s the beauty of walking with a toddler. It forces you to slow down, to linger for awhile. It forces you to open your eyes, to touch, to smell, to notice things that normally go unseen. 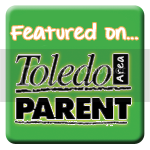 On toddler time, all that matters is the here and now. All that matters is the joy that can be found in the moment. And there is so much joy to be found. If only you slow down and open your eyes. Time is flying by; the world is changing at a rapid pace, but when you look at things through the eyes of a toddler everything momentarily stands still. There is no yesterday, nor a tomorrow. There is right here, right now. The sound of the stream, the beauty of a flower, and the delicious taste of a rock in your mouth. When we got back to the car (some carrying required), Oliver was exhausted. He fell asleep on the way home, and remarkably, slept through the dreaded car seat to crib transfer. Tucked in his tiny fist, was a rock that somehow made it from the park, to the car, and back to the apartment without me noticing. I gently took it from his hand and placed it on the dresser for when he wakes up. I might have to “accidentally” lose the rock if he once again decides to eat it for dessert. But the good news for Oliver is that there are many more where that came from. 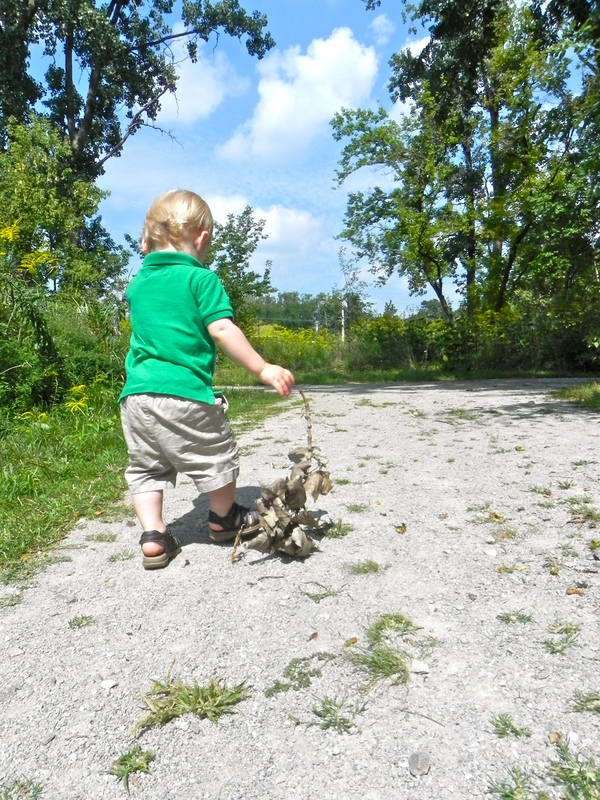 And without the stroller to hold him back, he can have as many rocks as his little hands can carry. Where do you like to take your little one for walks? 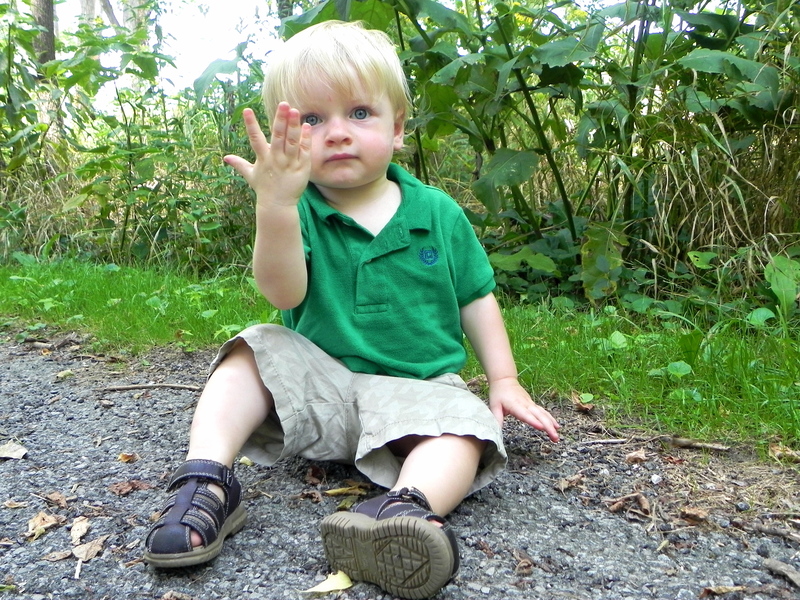 We love walking round our local nature reserve..and Rio too likes rocks..& throwing rocks, oh-ooh! ..gorgeous post! Love of rocks must be a toddler thing. I’ll be happy when he decides they are just for playing though and not eating.